Wall Street got a bailout. Main Street got a stimulus package. Average Joe and Jane Doe need help with their mortgage and the kids' tuition. Is there anything else on the Want List? How about BOOKS! We also need books: cutting-edge, award-winning business books to educate and inform ourselves about how the financial meltdown happened, how to keep the recovery moving, and how to keep it from happening again. 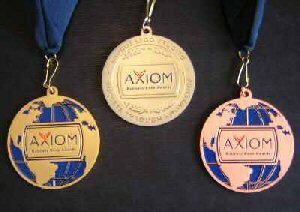 As it says on the Axiom Award medals, "Laurus Lego Erudito," or "Success Through Knowledge." Jenkins Group is proud to announce these results of the fifth annual Axiom Business Book Awards, honoring the best business books published during the past year. This list of Axiom Award-winning titles will assure the reading public that help is near, in a wide array of business topics, from Leadership and Entrepreneurship to hard-to-find categories like Business Ethics, Philanthropy and Business Fable. Read on and Prosper!